Includes 48" wide locking insulated panels, mounting rail, deluxe front header, front and side fascias, house-type gutter, two downspouts, hardware and caulking. Also includes four Dura-Post 2" x 2" columns complete with hardware, anchor brackets and concrete or wood anchors. 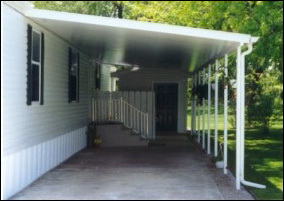 Includes panels, mounting rail, deluxe front header, side trims, house-type gutter, two downspouts, hardware and caulking. Also includes four Dura-Post 2" x 2" columns complete with hardware, anchor brackets and concrete or wood anchors.